Chad Hall and Sam Cothrun teamed up to win class 6100, Trophy Truck Spec in the 3rd Best In the Desert race of the season. With the Chevy Sliverado’s 4 wheel drive and the twisty mountain roads of North Eastern Nevada, it was their race to lose. Chad started 6130 in 9th spot out of 11. By Pit 1, 6130 had moved into 5th position on the road and by pit 2, Chad was first on the road and in first place. The truck ran flawlessly until a brake banjo came loose around race mile 110. Chad had to back the pace down a little with no rear brakes. Sam got into 6130 at pit 4, race mile 147. The BFG Pits got the banjo repaired and the master cylinder filled. Sam got back on the road with a 10 minute lead over the 6158 of Tony Smiley and Jeff Geiser. Sam ran trouble free with the only goal of not stopping. At race mile 235, the rear brake banjo came loose again causing Sam to have to back it down. At pit 7 , race mile 265, the pit crew repaired the banjo again and Sam was able to bring home for a win with a 7 minute lead over 6158. We will be headed to the lovely town of Parker, AZ for the Best in the Desert Parker 425. The race will be held on February 1, 2014. It will be a fun filled weekend of racing that we are greatly looking forward to. Chad Hall and Sam Cothrun plan to prove their driving tallents amoung the growing field of 6100 trucks. We are getting the 6130 truck ready as we speak and hope for good luck and safe travels to all of the race teams that will be showing. Come by and say hi and we will see you all in Parker!!! An impressive field of competition vehicles showed up to race in the annual VORRA USA 500 on a summer day in the Nevada Desert. Yerington, NV was the place for desert racing excitement on that September 1rst 2013. The race course in Yerington is well known for its enjoyable high speed layout with inclusions of rocky and rough terrain that demands respect from every driver. The Samco Fabrication Group T Truck left the start/finish line with Cody Bullock behind the steering wheel and Matt Cummings navigating. A mid-pack start left a challenge for Bullock and Cummings to tackle as they started the day. The truck was running great and they were able to settle in to a good fast pace. Bullock and Cummings ran flawlessly for four laps and worked their way into the second position of the Group T Class, behind Don/Chris German. At the races’ half way point Bullock and Cummings handed the truck over to Sam Cothrun as driver and Nicolai Caviglia navigating. Cothrun and Caviglia set their sights out to pass The Germans for the victory in Group T. They were well on their way towards the goal as they made up some time approaching The Germans. On their sixth lap, they were seen coming into the main pit only about two minutes behind Chris German, who seemed to be running strong. Cothrun and Caviglia remained behind The Germans until they crested a hill to find the German truck pulled over where Chris German and his son Walker were feverishly changing a flat tire. The Samco Fabrication Truck continued down the course in clean air hoping to create a gap that the Germans would not be able to overcome. The Germans are fierce competitors and they were did not lose very much time changing the flat tire. They caught up to Cothrun’s dust and without a doubt were trying to get a good run at passing the Samco Fabrication Truck. Cothrun did not give them a chance as he was able to move fast enough after exiting the main pit to separate the trucks by a decent gap for the final lap. Everything was happening according to plan until about half way around the track on the last lap, when the truck seemed to be running out of fuel. Cothrun and Caviglia stopped into two pits on a whim and begged for fuel to continue the race. Some very kind spectators were able to replenish the thirsty truck on those two stops by pouring a few gallons in each time. Each stop was heart-wrenching for Cothrun as he knew that The Germans could be coming around to pass at any time. Luckily, The Germans were not able to take advantage of the situation and Cothrun and Caviglia drove the truck into the Finish in first place. Once they were finished they learned that they had not only beat all of The Group T Trucks but they had proven faster than the whole field of vehicles giving them a first overall finish. Please come see us at the 2nd Annual Silverstate Off-Road and Powersports Day!! 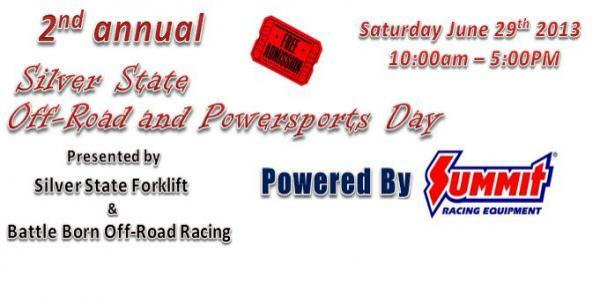 We will be on hand to enjoy this annual event hosted by Silver State Forklift. The event will be located in our front yard on Watson Way in Sparks Nevada Saturday June 29 2013. Last year it was great to see this "Off-Road Block Party" type of gathering. There will also be a raffle during the Silverstate Off-Road and Powersports Day, of which proceeds will go to support a GREAT organization that recognizes all of the people that made the sport of Off-roading possible and enjoyable. This organization is The Off-Road Motorsports Hall of Fame (ORMHOF) located right here in Reno, NV. Save the date and we hope to see you there!! We have recently acquired the tooling and training necessary to provide magnaflux inspections... right here at Samco Fabrication. This addition to our list of services will dramatically expand our abilities to analyze individual parts and prevent many types of failures before they develop into expensive or dangerous situations. Magnaflux is well known for presenting cracks and other structural anomalies in parts that are not noticeable upon visual inspection alone. Depending on the location and magnitude of the potential failure point, magnaflux provides options of repair, replacement, or confidence in a solid part. We are ready to inspect a variety of parts including, but not limited to: axles, spindles, suspension components, drivetrain components, gears, spools, hubs, engine components, ect. Magnaflux takes the old saying to the next level, "In order to finish first in the race, you must first finish". Magnaflux increases the chances of that finish with a greater confidence that your key parts are sound enough to start the race. The inaugural USA 500 started on the downtown streets of Sparks, right across from the Nugget Casino, and right in the stomping grounds of the Samco crew. Contingency and tech inspection were close enough to skip trailering and drive the truck from the shop and with a start / finish line in Fernley just 30 miles east of Reno, without a doubt this is our home race. However, it wasn’t all business in downtown Sparks, the festivities included rock crawling club competitions, a freestyle moto demo, and a chance to party at local favorites such as the Cantina, Great Basin, Blind Onion, Oskis, and of course the Nugget. Unfortunately, the fun would have to wait until after the race for the smart drivers. The week before the race was also the time to pre-run the course, allowing drivers to become more familiar with the race, to know when to go fast, and where to be cautious. This year’s USA 500 is three loops, each just over 150 miles, and a leg leading to the Start / Finish line north of Fernley. The race is a challenging 529 mile course featuring a great mixture of treacherous high speed rollers, silt beds, fun washes with a few boulders on the side to “keep it real”, the “Little House on the Prairie” section, the gnarly rock garden, some very tight and slow switchback roads through the mountains and all-in-all a diverse and fun course. Fortunately the temperatures were nearly perfect, barely pushing into the 80’s for the hottest parts of the race. It is a good time of year to be racing in Northern Nevada! Teaming up behind the wheel of the Samco 7272 with Sam Cothrun was veteran racer “Baja” Jim Anderson. Jim has raced and won for many years behind the wheel of Class 5, Class 10 and at the front of the field, Class 1. Riding shotgun with Jim is Alex Baker. Alex is familiar with the mechanics of the Samco 7272 truck and has navigated for some of the best Group T racers in the business. conditions. Jim passed points leader Hollenback about 5 miles in and headed to Pit 1 to start the loop section. Just over a mile past Pit 1 on a high speed roller section known as “endo alley” is an especially dangerous drop-off, here the 7272 passed fellow T competitor Mike Koneig parked at the bottom with a bent and broken front end. We found out later that Mike’s co dog Mongo had broken his back on the unintended launch off the drop-off. Fortunately this serious injury was not an immediate threat to his spinal cord. Our best wishes go out to Mongo in his recovery and props to the Total Chaos team on fixing the truck and soldiering on towards the finish line. Jim passed Povey changing a tire a few miles later and physically moved to the front of the T class, giving him clean air to run in. Through Pit 2 Povey was 12 minutes behind, and through Pit 3 Povey whittled the lead to 9 minutes. Jim ran uneventfully until the notorious rock garden where sometimes even a conservative pace isn’t enough to prevent a sharp rock from damaging a sidewall. Flat one of the day was a slow leaker and Baker jumped out and changed the flat before losing position to any competitors. Ten miles later coming out of the mountain switchbacks, Baker notes 2 unlimited machines, a Trophy Truck and a Class 1 car closing in. Knowing the fast sections were coming, and with the 7272’s limited horsepower, Anderson and Baker decided to be sportsmen and let the “faster” guys pass. This move proved costly as the potentially faster cars topped out at a less than impressive 75 mph. It took the next 50 miles to undo the misjudgment, no more Mr. Nice Guy was the lesson learned. Jim handed the truck off in first place to Sam Cothrun and first time co-dog, “Dirty” Harry Wagner. Harry is a long time friend of Sam and is a writer and photographer who was in need of a story. Harry was fresh off the airplane from working in Alaska and suited up to be ready for action in the 7272. Sam and Harry jumped in and buckled up with topped off fuel and freshly installed light bar, ready to extend our lead. Sam hit the fuel pump and pushes the start button to hear a less than glorious… click... nothing. The team sprung into action, checked battery voltage and then grabbed the spare battery from the pit trailer. Wilbur Cothrun jumped under the truck and with the help from the crew, swaped out the battery. Unfortunately the battery has been a spare for the better part of 10 years and not surprisingly was less than effective. Start button… click… nothing. The crew run around to fellow racers and luckily for us a Class 9 car is deceased and on the trailer, a perfect organ donor for our race truck. The sight of Steve Rudd’s young son running through the pit with the heavy battery, giving it everything he had sprinting back to the pit burned into memory the dedication and hard work that all of our pit guys give us. This third battery was the charm and Sam and Harry resumed the race 20 minutes down, running 3rd in class behind the formidable “Class 8” T trucks of Gary Hull and Don German. Sam picked a pace to slowly chase down first place with Harry furiously calling out corners, mirrors and gauges to aid the driving. Sam had one close call in the “Little House on the Prairie” section, hitting a cross grain ditch a bit too fast and kicking the rear end up uncomfortably close to digging in the front bumper. The furious corner calling and gauge updates gradually faded an hour into Harry’s stint as co dog. The lack of horizon reference from not looking up enough combined with the recent small aircraft travel caught up to the soon to be dirty Harry. Coming into Pit 3, Harry admitted that possibly he should jump out but unfortunately Sam had not pre run half the section from Pit 3 to Pit 1 and Sam needed the navigator’s help to not get lost and loose time. As many can attest to, once motion sickness has set in it is hard to shake. The ride to Pit 1 became a living hell for Harry and, unable to remove his helmet, the sickness caught up to him. Harry soldiered on, called dangers the best he could in his disoriented state while shooting to get out at Pit 1. The ride of his lifetime instead became a merciless torture chamber. Past the rock garden and through the twisty tight mountain pass the Samco 7272 passed German working on his truck. Running in the dust of Hull and unable to find a suitable and safe passing area Sam was badly slowed. Finally, at the top of the Tulon pass, Hull pulled over to add oil to his engine, handing the lead back to Samco. Harry was looking for relief coming into Pit 1 but Cothrun knew this wasn’t the best place for him. Reasoning with Harry that it is “all straight roads from Pit 1 to Pit 2 where your truck and the Samco Pit and a nice shower, it will be easy”, convincing a reluctant Harry to go onto Pit 2. Unfortunately, the straight roads were a roller coaster, re-igniting the nausea. Sam radioed Pit 2 to get a new co-driver, a splash of fuel and to uncover our new Rigid LED front lights. Finally arriving at Pit 2, the crew drug Harry out and Baker resumed the co-driver’s spot for the last leg of the race. Sam was informed at this point that he was running second on the road, nine minutes down physically to the overall leading Class 1 of Jerry Wood, props to those boys for leading overall in their first race in Class 1. With the news of second overall position, Sam picked up the pace to chase down the overall leader. There are very few chances for a limited class racer to get an overall win and Cothrun could almost taste victory but with well over 100 miles left in the race it was far from over. Sam had to borrow Jim’s helmet due to issues with his own but the approaching dusk and Jim’s amber lens forced Sam to stop for a set of clear safety glasses at Pit 3 and run with the visor up to the finish. The overall leader was a mere 3 minutes ahead, and dust was now visible. At the rock garden Wood slowed with a race ending pulley problem on the engine, handing the physical lead over to the 7272. Despite taking care through the rock garden to not get a flat Sam pushed just a bit too hard on a sharp slow speed right hand turn and clipped a boulder with the left front tire which completely tacoed the wheel and reduced it to scrap yet miraculously the BFG tire was fine. Baker and Cothrun jumped out for a very quick tire change and got back on the course. This put Cothrun in a position he had never been in, no spare tire with many miles of desert ahead. This slowed the pace dramatically as survival became paramount and the overall win became less important. On the tight switchback roads, Cothrun ran an ultra conservative pace, and worked on radioing Don and Debbie Ohnstead who were near the top of Tulon Pass waiting for a spare tire handoff. They had handed one spare over for the previous flat and were waiting on the Pit 2 crew for a spare tire to reload on the rack on the race truck. As the 7272 made the tight right turn by the Ohnstead visual, the pit crew was still minutes away, too far to wait. Sam decided to push on to Pro Pit where he knew a tire awaited. 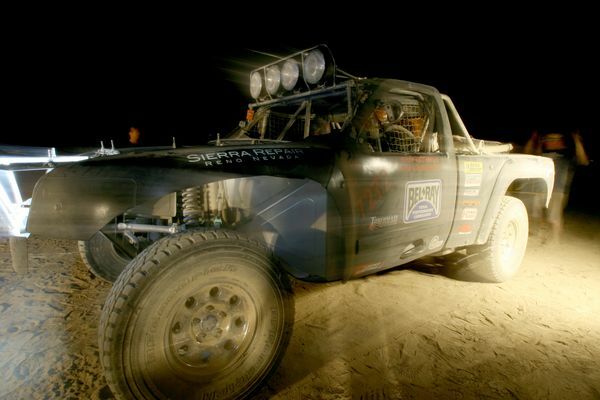 The Rigid lights pierced the night, allowing 90 plus mph on the way to the final pit. Sam and Alex finally hit Pro Pit and an extra tire was finally back on a truck, ending a nail-biting 50 miles without a spare. The final leg down the tight switchbacks and rocky downhill to the finish in Fernley passed without drama. Samco Fabrication Off Road Racing had won its first Overall finish at the first ever USA 500, a huge accomplishment by itself, and an even bigger feat in an underpowered truck. This victory marks the 4th consecutive victory for the Samco 7200 truck as well. To cap it off the Hall Rally Truck racing in Class 1 that was designed and built at Samco Fabrication finished a very close second place overall and first in Class 1. This is the first victory in this extremely fast new machine, without the minor rear end issues they would have won overall by nearly an hour. The Samco prepped Hummer H3 driven by Damien Michelin, Rod Hall and Mike Winkel won the Heavy Metal Production class, giving a 1-1-1 victory to all Samco machines. Congratulations to Damien on his first victory and to Josh and Chad Hall on the first victory of many in the Rally / Trophy truck, a proud weekend for sure for the entire team. It is interesting to note, the winner of Group T has a 6 cylinder, second place has a V8, and third place has a 4 banger After celebrating at the finish line, time to load the 7272 on the trailer … ignition on, fuel pump on… click… nothing. Huge thanks go out to our Pit crew, Christine, Wilbur, Carl, Chris, Aaron, Todd, Alex, Ape, Jeff, Megan, Mark , Skeeter, Elliot, and everyone else who helped. This race was won in the pits for all three of the Samco winners! Special thanks to our sponsors, we could not do this without the partnership we have with you all. And thanks VORRA on an exceptional event! Cody Bullock's 1975 Dodge W100 was featured in the August, 2011 issue of Off-Road magazine. Check out the article for more details and check out our build pics in our gallery. Race-Dezert.com and Vorra did a nice video on this year's race. 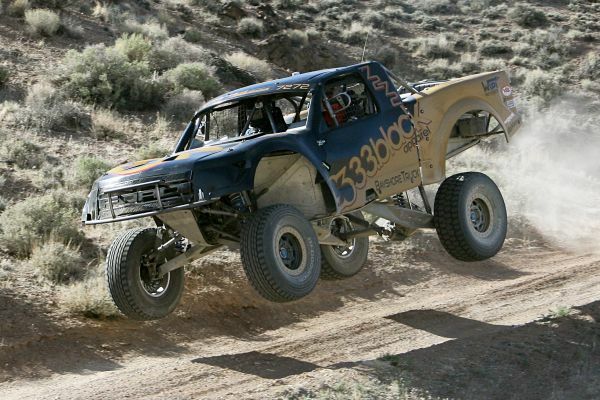 The VORRA Yerington 300 continues to be a popular race, with 14 entries in the ever growing Group T class that combines trucks such as Class 8, 1450 and 7200. On Friday, the Samco 7272 truck drew the first off the line position at the Casino West drawing party, a lucky but challenging place to be on race day. The real story started months before the race with preparation and the ever present need to improve the speed and performance of the truck. During the complete preparation of the truck, a new 304 stainless equal length step header was fabricated, using Hedman stainless mandrel tubing, three SPD merge collectors, a 4” Magnaflow muffler and 90 hours of time. This project is an important step in the engine development of the Atlas 4.2 inline 6 cylinder engine in the truck. A new high powered engine is in the works to replace the current older stock low powered engine. With weeks to go, Sam with typical fabricator optimism, was running late on the exhaust fabrication, but thanks to help from the crew of Austin, Ogg, Ape, Wilbur, Baker, Povey and Sherm , managed to get the exhaust as well as the Fox Shox tuning. 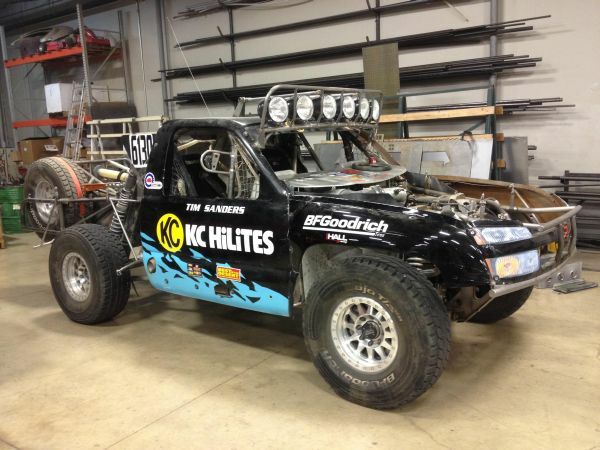 The new 6.20 Trophy Truck gears were set up and installed, and fresh paint completed. The truck then was successfully tested Thursday afternoon, cutting it close to the deadline. Saturdays schedule was pre run, tech, drivers meeting all followed by the popular parade down main street for the fans and kids. Behind the wheel of the 7272 was Pit Chief Christine Cothrun, in her first taste of the truck. Saturday evening the predictably unpredictable Nevada weather showed just a taste of race day as rain, sleet and sporadic snow blew in. Sunday dawned a cold, overcast windy morning with Sam Cothrun behind the wheel of the 7272 truck and brother Wilbur Cothrun riding shotgun for the entire event. Starting first off the line forces a more aggressive strategy than normally run, with 13 fierce opponents directly behind you, there is no choice but to run quickly. 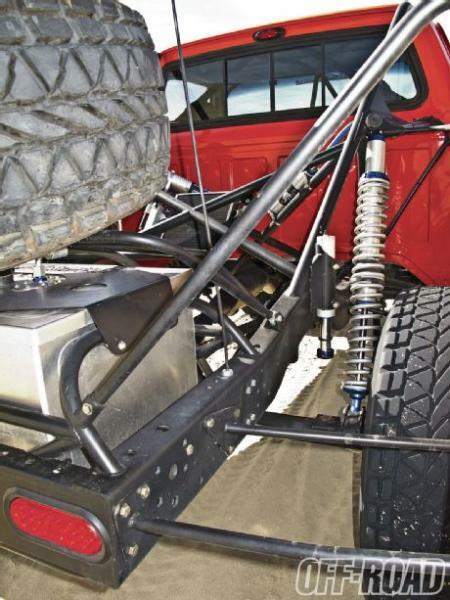 With the 75 gallon fuel cell, there is a 500 pound weight change during a race causing the truck to be heavy and slow at the start, and fast and twitchy at the finish of the race. This year’s VORRA Yerington 300 was a new format with three long laps and three short laps required, with the first lap a long lap and all subsequent laps the choice of the driver. This race format throws a monkey wrench at having any hope of accurately tracking competitors, forcing the teams to make a few guesses and run flat out to guarantee victory. Sam chose to run all three long laps first and finish the short laps at the end. The 7272 started directly behind the final Class 1 car and two spots behind team mate Josh Hall in the Samco built Hall Rally Truck. The race started with a rare luxury for desert racers, perfectly dust free air for Sam and his opponents. The race started uneventfully for the Cothrun brothers, allowing them to settle into a groove until the “Comfortably Numb” section 20 miles into the race where Sam hit two rocks in short succession, bringing attention that a flat would be doom for the lead of the race. Fortunately the BFG KRs put up pretty well with sinful driving and rocks, Sam’s first lucky break of the day. The Samco 7272 passed Scudder’s Class 1 shortly thereafter while they were changing a flat and Samco went on to finish the lap. Five miles into the second lap while climbing a long grade and not paying attention to mirrors the Cothruns received a jolt as Scudder’s unlimited car thumped and passed on the grade, highlighting our lack of power and hopefully not slowing him down . The second lap saw Povey leading physically after running the shorter loop and started the mix-up for the lead… nobody knew who led the race until the last lap. For Samco, roughly one minute was lost with a wrong turn near the end of the lap with the distraction of a rolled buggy. Luckily nobody was able to pass until Samco regained the course. On the third lap near the mine area approximately mile 45 in the loop it started raining and snowing, wetting the track. Sam picked up the pace, gaining confidence in some tight sections and running quickly. The wet conditions caught Sam off guard in a set of tight rollers, a left turn over a roller pushed the rear of the truck sideways as the dirt turned slick, hitting the face of the next roller sideways and putting the truck up on two passenger wheels in a “bicycle” for a moment. This caught the attention of both Cothruns, forcing a more conservative approach. Fourth lap, at the primary pit for Samco – Pit 2, Samco race stopped for a single 11 gallon dump of fuel, and to check a vibration. Rob stopped the truck, Aaron and Matt checked things over, Carl and Phil dumped fuel and Pit Chief Christine Cothrun gave water and refilled our rag supply. By the fourth lap Samco was lapping quite a few slower racers, with a close call with a blue and white Ford pickup as they pulled over and slid sideways nearly getting hit by the Samco boys. No harm, and on down the course to finish the fourth lap. The fifth lap had one minor scare, almost blowing a slow speed turn, followed by the sixth lap, a very nervous lap as all of the sounds of the truck and the unknown position of other competitors looms heavy in drivers and “co–dawgs” minds. Samco crested the hill into the start finish area, noting a familiar sight: Sam Berri parked all by himself at the finish. On the one year anniversary of the first race for the Samco 7272 truck, Samco captures their third consecutive class victory, and second overall at the 2011 Yerington 300. This also marks a pair of second place overall finishes in a row, behind the Sam Berri juggernaut , and proud of it. Special thanks to all who made this race happen, and all that helped. Our sponsors are invaluable and a true partener in racing. Next race for Samco Racing is the Vorra USA 500 !! In-truck footage from the Samco 7272 (and other trucks) from the VORRA short course race at Prairie City.